Introducing Pro-Till® by Degelman. The fastest and most versatile piece of tillage equipment you will ever own. Pro-Till® shreds heavy fall residue, opens up spring fields, levels ruts, destroys clods and produces an absolutely perfect seed bed. Pro-Till® is your single tool for tillage. Degelman designers are passionate about getting it right. Farm tools with the least amount of moving parts will simply last longer. Degelman is renowned for building overbuilt and under complicated equipment. Less is always more. A Pro-Till® cultivator has the unique ability to cultivate and warm the soil during cold wet conditions when all other forms of tillage plug and fail. In the midst of a long wet spring, getting seed in the ground to allow adequate time for the growing season is critical. Heavy cold soils need to be black and warm for ideal germination conditions. In as little as one day and after one pass, frigid heavy residue soil is cut, turned, mixed, reactivated, warmed, topically dried and ready for planting/seeding. Pro-Till® in the spring can mean the difference between success and failure. Degelman Pro-Till uses BKT FL-630 Plus High Flotation tires, offering an extremely wide footprint area for maximum performance in wet soil conditions. With a 30% taller tire, Degelman Pro-Till minimizes rolling resistance while reducing the impact on soil structure. Pro-Tills’ BKT FL 630 tires use a non-directional lugged tread designed to shed mud; ideal for wet conditions. Thees tires wear longer and save you fuel and time in the field when compared to traditional ribbed tires. The Alliances high volume radial flotation tire series was designed to optimize the efficiency of agriculture transportation. The 382 series includes all steel construction and a deep non-directional block pattern which enables high mobility in the field as well as comfortable high-speed transportation. Cut, Weed, Mix at Incredible Speeds. plugging are eliminated with the Pro-Till®. Yields can be hampered by tough heavy residue from crops like flax, peas, sunflowers, barley, wheat, soybeans, and BT corn. This is no longer a problem. Pro-Till® is ideally pulled fast - 10 to 14 mph fast. Our patent pending combination of independent disc arms, with small diameter shallow discs, motion dampening rubber suspension, sturdy frame and cutting edge consolidating rollers allow this tillage tool to slice through residue as never seen before. Pro-Till® will cut, weed, throw and mix soils at incredible speeds and usually in one pass. This is a true residue-killing machine. Pro-Till® is your single spring and fall solution to tillage needs. Pro-Till® is ideal for field finishing, leveling and filling ruts and tracks in the spring or fall. Today’s heavy tractors, trucks, sprayers, grain carts and center-fill planters can produce deep compacted ruts that seriously restrict roots growing space, inhibiting yields and potentially damaging expensive equipment. The Degelman Pro-Till® compact disc cultivator has just the right amount of dirt carrying capacity to level almost any field. One or two additional cross direction passes may be required to completely level and fill the most severe ruts. Seedbed preparation is the very foundation for a strong growing season. Ideally, robust biological activity is enhanced through the accepting, storing and transmitting of water, gases and nutrients. Pro-Till® high performance cultivation levels ruts, crushes clods produces an absolutely perfect seed bed. Pro-Till® is your single tool for tillage. Degelman’s floating section design allows the Pro-Till® to “Self-Contour” as it follows the curvature of the varying terrain. The independent wing sections allow horizontal contouring for steep inclines or downward slopes up to 8 degrees. The contour angles between the front frame and rear center section also provide excellent front to back flexibility to help traverse demanding hills and valleys. This floating, self-contouring design coupled with the Pro-Till® independent discs help produce a flawless, uniform field. Degelman equipment is tested to the limit in severe operating conditions. Any unforeseen problems were analyzed and further improved. As a result of years of development and field testing Pro-Till® is a piece of equipment without compromise. 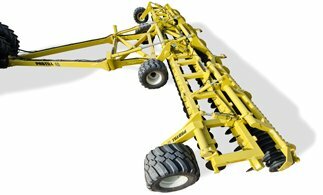 A unique benefit of the Pro-Till® cultivator is the ability to completely rotate the frame and rear disc sections off the ground. Together with the impressive weight distribution of the four oversized high flotation tires, operators can back up, drive forward, unplug, or walk away from your predicament. Weight equals penetration. Without it, the discs will ride out of the ground if soil conditions are too hard. In order for the discs to work well in hard soil and heavy trash conditions an adequate downward force is required. Other machines require extra weight stacks, but the 32,000 lb. Pro-Till® cultivator carries this weight in the frame where it should be. The discs have a shallow face to eliminate compaction layers and the high tensile strength steel arms provide maximum flow through with three times the spring back of normal mild steel. Traditional disc gangs are severely limited by their ability to process residue and level properly. They can plug very quickly during wet seasons, are limited in speed, cannot resist rocks and due to their deeper tillage have a tendency to bring clay soil to the surface. Pro-Till® disc arms are preloaded using four natural rubber spring elements that allow the disc to skate over severe stones, yet perfectly follow the contours of the land. When a stone is encountered, the rubber elements compress automatically dampening the impact and providing protection while immediately springing the disc back into operation. The concave disc does an excellent job of tilling and inverting the soil. The action of the disc depends on the speed. Notched concave discs provide a very aggressive cutting edge that is well suited for soil penetration. These discs are a good choice for residue management. In dry, non-sticking soil conditions, the Degelman cage roller ensures any clumps that may be left behind are disintegrated, providing an even, accessible seedbed with moderate consolidation. The helical solid shafts are the largest in the industry; at 1.5” in diameter they provide superior protection against rocks and any other debris that may pose a threat in the field. These rollers are an excellent all-around roller suitable for any types of soil conditions and offer very good consolidation. The micro-ridge shape of the Pro-Till® rollers allow water to be stored in the corrugated valleys, driven to the lower soil layers and stored in a uniform way. Proper soil consolidation is critical to allow water stored in deep soil layers to flow. A special semi-pneumatic technology is integrated into the Pro-Till® rollers making them work well in rocky soils and more resistant to wet conditions. Designed by OTICO of France, these exclusive rubber rollers are formulated from special rubber compounds. Uniquely molded over a high strength steel core, they are also hollow giving them the ability to flex each turn, partly absorb shock from stones and hard conditions, and also helps shed sticky soils with every revolution. The minimalist approach to these scrapers leave long arms wich create great trash flow. The scrapers are easy to adjust, easy to clean and are removed with the pull of a pin. The Hardox wear plates are the same as those used in mining, construction, quarries and excavation and are 8 x more abrasion resistant to that of mild steel. Quickly adjusting the front and rear cutting depth is simple. At a 2:1 ratio for quick adjustment, removing each 1/4” depth stop lowers the cutting depth by 1/2”. A typical cutting depth of 2” is recommended but depending on soil conditions and vegetation, the operator can quickly adjust the front or rear cutting depth. Real world conditions can be harsh. Our unique Pro-Till® bearings withstand constant vibration, high shock and severe loads. They are maintenance free. These long life double-row angular contact ball bearings are designed to provide years of reliable operation in every kind of soil condition - from cold and wet to dry and dusty. Our bearings are capable of supporting heavy loads, are double sealed on both sides. The machined housing is coated for extra anti-corrosion protection and an additional high-performance triple lipped cassette seal is designed to prevent contamination. To further prevent damage, a machined protective washer is positioned to create an additional seal. Two grease reservoirs located between the seals ensure that the seal lips are permanently lubricated and therefore prevent dry running. After extensive use the bearing housing itself can be changed quickly and easily with one bolt. These extreme duty, double-row, roller bearings are proven through years of performance in applications ranging from marine to mining. The sturdy one-piece flange unit and bearing insert is completely assembled, sealed and lubricated. The phosphate coated insert bearing provides excellent corrosion protection. Single lip contact seals mounted in the outer ring of the bearing ensure superior sealing under contaminated conditions and allow higher misalignment capability. These Devol composite bushings are maintenance free and greaseless. They are shock, abrasion and wear resistant. The bushings are very low friction making them durable and hard wearing. They will not corrode. A uniform, slightly consolidated yet corrugated surface is a perfect seedbed. Clods and bigger elements are broken and consolidated into the soil with the finer loose elements. The soil is now evenly distributed and sized allowing seeders, planters, drilling discs or coulters to get in and do their job. Uniform seedbed packing provides uniform placement and seed depth. Planting and seeding speed and positioning will be greatly improved due to the vertical and horizontal even structure of the soil. The ridged shape of the rollers creates highly consolidated valleys and less consolidated ridges creating the perfect bed for seed propagation. The ridged shape of the rollers creates highly consolidated valleys and less consolidated ridges creating the perfect bed for seeds. After residue has been cut and mixed, our exclusive corrugated rollers finish the field to perfection. The hollow corrugated rubber design sheds soil, breaks up the larger clods and consolidates the soil to bring fine earth in contact with residue to optimize decomposition. Corrugated rollers are central to breaking down straw and encouraging seeds to germinate and grow in the shortest possible time. Effective soil to seed/root contact enables an efficient transfer of nutrients combined with minimal moisture loss, especially important during dry years. Healthy soil must be allowed to breathe and tillage can drastically change the configuration, continuity and size of soil pores. This exchange of gases is the secret to the Pro-Till® rollers: the trapezoidal shape of the rollers will allow the profile to dig into the soil and lightly pack the soil vertically as well as laterally. A highly compacted zone beside a less compacted zone set in ridges is the optimum method to allow a rapid exchange of carbon dioxide and oxygen between the soil pores. The Pro-Till® rollers are key. The rollers consolidate the soils, provide valleys for water storage, prevent capping due to heavy rainfalls and create ridges to reduce wind erosion. The soil is protected against heavy rainfalls, helping water stored in the soil to come up to the topsoil layers. Row upon row of consolidated and unconsolidated soils prevent surface crusts and allow the soil to breathe. Properly consolidated fine soil tilth and residue combine with micro-ridges to reduce wind speed at the surface and diminish wind erosion. From start to finish Pro-Till was designed with a user experience in mind. Our Kennfixx knurled grip couplers are ergonomic and color coordinated to match your tractors hydraulics. When not in use, the hydraulic hoses are tucked away neatly in each of their own color coded slots. The user manual is easily accessible and safe from damage.